Zihuatanejo Mexico and its neighbor, the modern resort of Ixtapa, are vacation destinations on Mexico's Pacific coast about 150 miles (240 km) north and west of Acapulco. It has about 65,000 permanent residents. Both Zihuatanejo and Ixtapa offer miles of sandy beaches in neighboring bays. Some say Zihuatanejo is like a smaller and more relaxed version Acapulco because it's an older city that welcomes tourists, while Ixtapa is a "little Cancún," in that it is a recently built, planned resort. 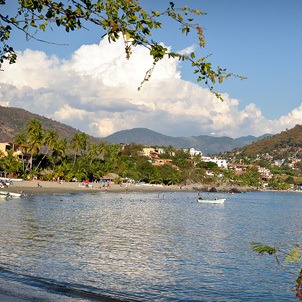 Zihuatanejo gained notoriety as the refuge of the two heroes in the Stephen King novel and movie, Shawshank Redemption. Morgan Freeman's character, Red, reacts to hearing the name for the first time with "See-what?" This phrase is now something of a password among English-speakers who have come to love the destination. Until about 1975 Zihuatanejo Mexico was a small fishing village. Fishing is still important, but it is sport fishing that boosts the local economy as visitors arrive in search of marlin and other "big game" fish. Zihuatanejo main beach is "Playa Principal," where fishermen dock and sell their catch into the local markets. The "Paseo de Pescador" (fisherman's path) connects the town docks with the museum of archeology, about a quarter of a mile away, and to the many shops, bars and open air stands. Farther south is "Playa la Madera," with a sandy shore and calm waves. "Playa la Ropa" is a wide sandy beach on the east side of the bay, perhaps the most beautiful beach in the area, with plenty of seafood restaurants and hotels. It is a good base for water sports (like the banana boat or jet skis). "Playa las Gatas" lies beyond, a small, natural cove that makes for excellent swimming and snorkeling. Water taxis run between Playa las Gatas and the town pier. "Playa Larga" (Long Beach) is outside the bay on the open sea. It is both wide and very long (7½ miles or 12 km), with a sandy bottom. Many people enjoy jogging and horseback riding there. At the far end lies the fishing village of Barra de Potosí and Playa Blanca with an enormous mangrove lagoon, palapas, fresh air seafood restaurants, and hammocks. Ixtapa is a planned development four miles north of Zihuatanejo. It offers upscale boutiques and shops, modern, beach front condominiums and several luxury hotels. Restaurants, night clubs, a modern marina and two 18-hole golf courses complete the picture. El Palmar, the main beach, is a mile and a half of smooth sand where surfing is often possible. From the beach you have an unobstructed view of gorgeous sunsets over the Pacific horizon. Two small rock formations called "Los Morros" are just offshore. To the north, Playa Quieta, invites kayakers and swimmers with calmer waters. Beyond, Playa Linda is a place for excursions and horseback riding. From there you can visit the natural preserve of Isla Ixtapa. Zihuatanejo and Ixtapa offer a good bit of excitement to those looking for more than just a place in the sun. All water sports can easily be arranged: scuba diving, snorkeling, sport fishing, windsurfing, body surfing, surfboarding, sailing, water skiing, jet-skiing. In addition, the hardy can get out into natural terrain with hiking, horseback riding and sightseeing tours. Add golf and tennis to the mix as well as recreational shopping, eating and drinking, and it will be easy to fill up every day with fun. The two communities of Zihuatanejo and Ixtapa also offer a lively after-dark experience with lots of quiet bars and lounges and also several up-tempo discos.